“The Coffee Song” would be the most famous number to emerge from Julie’s tenure at the Copa, but the single most memorable incident is, in fact, one of the most famous nights in the history of American nightclubs. In September, 1946, the big opening of the Fall was set to be the team of Phil Silvers and “Rags” Ragland (real name: John Lee Morgan Beauregard Ragland). As is well known, Silvers, who went on to a long career on Broadway and television, was a fast talking, highly-verbal comic; Ragland’s style was contrastingly slower and more physical. They fell into the familiar vaudeville pattern of a sharpie and a stooge. A lot was riding on the team’s September 1946 opening at the Copa, but to everyone’s horror, Ragland died unexpectedly of uremia only about two weeks prior. Silvers had decided to go on as a solo act, but was nervous and frightened without his partner. He asked his longtime friend Frank Sinatra to help, but Sinatra was contractually obligated to stay in Hollywood, where he was filming his latest MGM movie, titled It Happened in Brooklyn (despite the title, it was actually being shot in Culver City, California). At the last minute, Sinatra, who was already perpetually in trouble with MGM for acting like he had a mind of his ow—in those days, the movie studios essentially owned all the actors they had under contract, who never questioned the orders they were given— decided to play hooky from Hollywood. He unexpectedly hopped a plane to New York, and presented himself to Phil Silvers the afternoon of the opening as the funnyman’s new stooge. MGM was horrified at first, but Sinatra’s surprise pitching in to help two pals, one living and one departed, was a bonanza of positive publicity – the whole country was buzzing about Silvers and Sinatra at the Copa. Most of these details are recounted in several biographies of Sinatra, including James Kaplan’s wonderful The Voice. But, surprisingly, all the written works that we’ve consulted somehow neglected to mention that Julie Wilson was right in the middle of the entire incident. 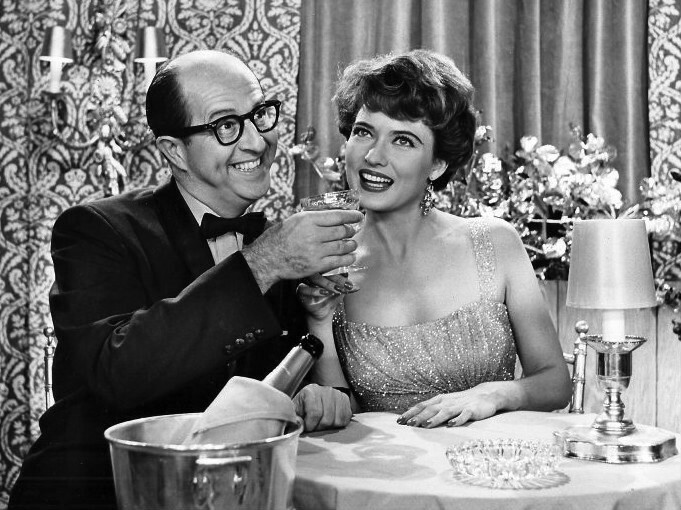 This was hardly the end of Julie’s association with either Silvers or Sinatra: in 1958, she had a highly memorable guest appearance on the Phil Silvers Show, aka You’ll Never Get Rich, aka Sergeant Bilko. (This will be the subject of a subsequent blog, yes.) Her other, most memorable encounter with Sinatra happened around 1950. “It was in London I had been in a little eating place, and they had a kid who played piano and wrote songs, Carroll Coates.” That’s where she heard the songwriter doing what would be his most famous number, “London By Night,” and she started singing it at her own shows. “I was working in a fancy saloon and Sinatra brought Ava Gardner in to see my show, and they were very nice, and he said, ‘I’d like to get a copy of “London By Night. '” Of course, Carroll was glad to give it to him! Sinatra wound up recording that song on three different occasions in 1950, 1957, and 1962 – one of the few songs to earn that honor, and to this day it’s Carroll’s best-known work.